Five-sixths of the way through 2018 and I am nowhere near accomplishing my goals for the year, so going forward I am thinking more in terms of “wish lists” than “to dos.” Near the top of my observational wish list is Dr. William Aprill’s “Unthinkable” course. Of course, we were at the 2018 Rangemaster Tactical Conference, which represents the leading edge of America’s defensive gun culture, so he may be living in the 4th iteration of our historic gun culture while most of us are struggling just to keep up with the 2nd iteration. 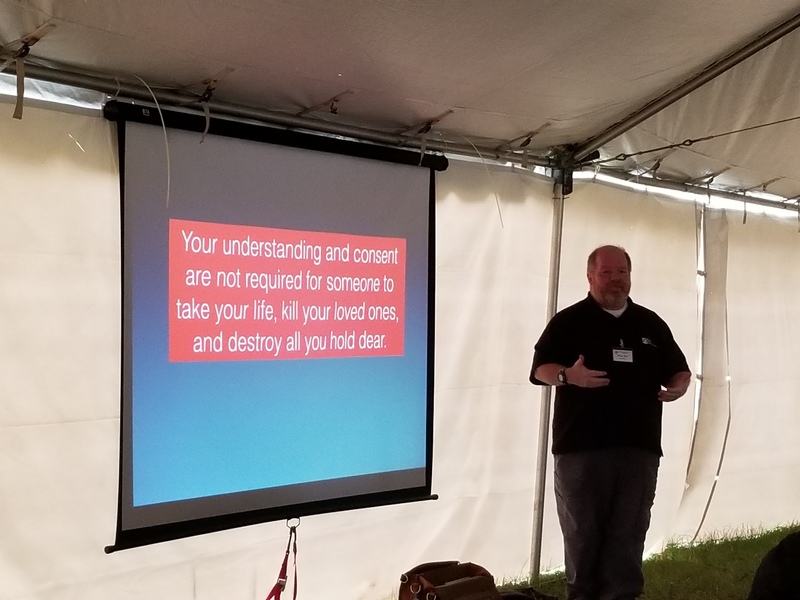 Dr. William Aprill presenting on “Violent Acts and Actors” at the 2018 Rangemaster Tactical Conference. Photo by David Yamane. In any event, by the time of that meeting, I had been stalking Dr. Aprill for some time on social and other new media. He continues to impress with his unique point of view. Just recently, he appeared on two episodes of Paul Carlson’s Safety Solutions Academy podcast (Ep. 440 – The Psychology of the Gun Agenda from 14 September 2018 and Ep. 444 – Mental Health and Guns from 10 October 2018). The latest episode on mental health speaks to an issue of great importance and one on which the gun community has much to offer. It is good to have Dr. Aprill’s expertise a licensed mental health professional in particular to speak to the issue of suicide, which afflicts gun owners without question. I’d like to see gun owners — myself included — do everything we can to be a part of the solution to this problem. Not because we HAVE to (or else they will take away our guns), but because we CAN. Indeed, because we WANT to. I am going to start collecting links to the many resources out there on gun owners and suicide prevention. If you know of such a resource, please post it in the comments here or the Facebook cross-post of this blog entry. Tags: Aprill Risk Consulting, mental health, mental illness, Paul Carlson, Safety Solutions Academy, Suicide, William Aprill. Bookmark the permalink. Great fan of Dr. Aprill. Attended some of his lectures; great stuff. As a Vietnam vet/corpsman and a retired PA, I have a special interest in this topic. As we know, a great number of suicides involve some type of mental illness, whether known to family and friends or not. Using a gun is more prevalent among males, although females do too. Guns are probably used more due to easy access and lethality. But if guns were not readily available, many other choices are available (i.e., Japan). Suicide is especially problematic among former military members with varying levels of PTS, which has not been adequately treated. These men and women are literally tormented by their past experiences and unfortunately death, by whatever means, is viewed as the only pathway to stop the pain. New treatment modalities need to be explored to give our service members the best chance of living as normal a life as possible. Some experimental treatment using MDMA has been encouraging. There is a great short video, “Dead Dog on the Left” (https://www.youtube.com/watch?v=3DoPyuXIp-Y ), which looks at this form of treatment. Guns are not the problem; they are only the tool used. Unrecognized and/or untreated mental conditions are the real problem.